This is an extremely beautiful arrangement of mix exotic flowers. Extremely stunning in looks, this colorful arrangement is a perfect gift that will not just grace but, will add splendid elegance to the occasions and festive. 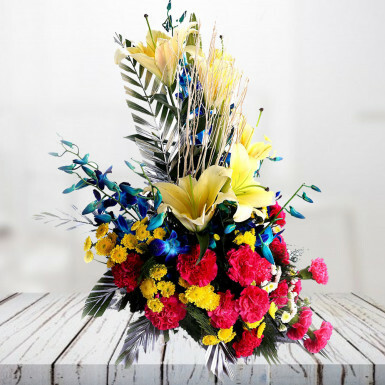 It is a stunning arrangement of 5 blue orchids, 15 pink carnations and 5 yellow lilies along with seasonal fillers. Your loved one will surely fall in love with this stunning arrangement, thanking you from the bottom of their heart for this extraordinary gift. Worth a million in fragrance, this mixed arrangement of flowers will surely boost the beauty of your room. This bouquet epitomizes love, care, beauty and romance and hence one must offer this gift to the person whom they love from the bottom of the heart. It is an ideal gift for every occasion to make the occasion a delightful one. So, go ahead and order this stunning gift.